The National Park lies mainly above the tree line, with some forest and scrub at lower altitudes in the so-called ‘salient’ near Nyeri. The Aberdares Forest Reserve of 103,300 ha large occupies the lower slopes, in three main blocks that almost surround the park, with Kipipiri Forest Reserve of 5,100 ha tacked on to the east. The Aberdares are extremely an important water catchment for the Tana River system, for the northern Ewaso Nyiro River, and for Lake Naivasha, and provide much of the water supply for Nairobi and adjoining Districts. The park boasts of an over 200 species bird checklist including the globally threatened Sharpe’s Longclaw, Aberdare Cisticola, Abbott’s Starling, and Jackson’s Widowbird. The range-restricted Aberdare Cisticola occurs locally in the tussock moorland, with densities of around 3.2 birds/ha in suitable habitat; more than 20,000 pairs are estimated to occur. The Red-tufted Sunbird is found on high peaks, foraging largely on lobelias while other montane Sunbirds are common at slightly lower altitudes. 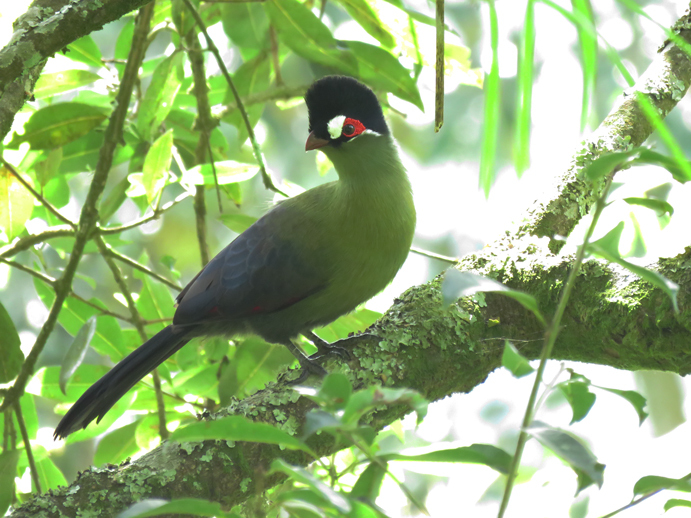 The park has records of five of the eight species of this Endemic Bird Area and 53 of the seventy bird species of the Afrotropical Highlands biome that occur in Kenya. The Aberdare region also contains three other Kenyan Important Bird Areas, namely; Mukurweini Valleys which are located in south-east of the Aberdares- an ideal habitat for Lantana species hence a suitable area for Hinde’s Babbler. This is a special attraction at a small, privately owned- Wajee Camp bird sanctuary. Kikuyu Escarpment Forest which is a southerly continuation of the Aberdare forest yet with a number of species which aren’t found in the Aberdares, namely; Orange Ground Thrush, Barred Long-tailed Cuckoo, Red-chested Owlet and Abbott’s Starling which is scarcely researched. Kinangop Grasslands which are on a plateau west of the Aberdares. The Kinangop grasslands are the major spot for the Sharpe’s Longclaw, one of Kenya’s national endemics. It was at the famous Treetops of Aberdare Mountains where British Princess Elizabeth was informed that she had become Queen in 1952 on news of her father’s death.